The front page article in the February 2012 issue of The Advocate, titled “SLOs creep into syllabi and faculty evaluations in violation of contract and academic freedom”, written by AFT 1493 Co-Vice President Teeka James, and representing the views of the AFT 1493 Executive Committee, generated a significant amount of faculty discussion around the district. Below are two responses to that article, one signed by a group of 26 faculty from all three colleges and one from the three SLOAC Coordinators. A brief clarification by the AFT 1493 Executive Committee of a few points in the article that seemed to be misunderstood by some faculty follows. As SLOAC coordinators on our respective campuses, we thank you for articulating some faculty’s concerns about the SLOAC and welcome the opportunity to respond. We prefer transparency, as much as with our fellow colleagues as our students. We hope that this ongoing dialogue will yield the best possible conditions for faculty to engage in the SLOAC and to accomplish what we see as its impetus: to improve student learning. We want to make it very clear that we share your concerns about the SLOAC evolving into an insidious form of “No Child Left Behind” (NCLB), or assessment results being used in faculty evaluation. Back in 2005, when we were first told about the SLOAC as an accreditation standard, all three campuses quickly convened steering committees to create SLOAC processes with a clear philosophy. As articulated in our philosophies, the primary purpose of the SLOAC is to improve student learning, which is facilitated through faculty dialogue about the core elements of a course, grading methods and criteria, teaching methods, etc. These conversations aren’t intended to impose a uniform curriculum or course delivery on individual faculty. Rather, in discussing assessment results that point to a need to improve, faculty have an opportunity to troubleshoot, to share with each other what works, to articulate a grading criteria that they can share with students and therefore demystify the evaluative process. Granted, those conversations may already have been taking place; but the SLOAC provides a framework and focus for them. Clearly students stand to benefit from these discussions because we have their interests in mind. The longer we have a SLOAC process in place, the more time we have to work out the kinks and therefore have a proven process that works for us. Our proven process, in turn, serves as the most potent evidence against the need for an outside agency imposing their model on us, which may or may not include sanctions when our students fail to fulfill the SLOs. Given that each campus has entrusted a group of faculty to create a SLOAC process, we were puzzled that the SLOAC was cast as administration driven. All three campuses have SLOAC Committees, which are represented by faculty across the disciplines. We’ve deliberated for hours to forge processes that are meaningful, manageable, and complement our respective campus cultures. We’ve also provided considerable training in writing good SLOs and designing valid assessments. And so now at this point, we’ve asked the administrators to further support our efforts to get faculty involved. Some faculty feel that the SLOAC is just a fad, or that it’s a waste of time. Anyone serving on an accreditation writing team knows that the SLOAC is not only here to stay, but very much woven throughout the accreditation standards. However, faculty should be engaged in the SLOAC not because it is required by accreditation standards or our deans, but because we should always have the goal of improving student learning in our courses and programs. If students were succeeding in our courses and graduating at a 90 to 100% rate, perhaps the SLOAC is a waste of time. The fact of the matter is that our students are not succeeding at that rate. The SLOAC offers one means to reflect on what is within our purview and control so that we can offer students the best possible learning experiences. The onus is on faculty to make the SLOAC process worthwhile; it’s only as good as we make it. Ultimately the SLOAC is about students, and student success, which leads us to our last point: SLOs on course syllabi. SLOs on syllabi are not required by our collective bargaining contract; however, there are many items that are good practice to include and are not required. Examples of these items are policies on late or missed work, classroom behavior, electronics in the classroom, academic integrity, and how to succeed in the course. More importantly, SLOs on syllabi help students to better understand the relevance of the curriculum since SLOs explicitly articulate what students are expected to be able to do with what they learn. That should be the aim of any college, according to the Accreditation Standard II.A. “The institution assures that students and prospective students receive clear and accurate information about educational courses and programs and transfer policies.” We would venture to add that the stated grading policy should include grading criteria, perhaps even rubrics, so as to make transparent for students how their work is being evaluated. Secondly, the union does not have exclusive say over what goes in a syllabus; the Academic Senate is charged with this oversight as part of the 10+ 1 A.S. responsibilities. Furthermore, SLOs do not infringe on academic freedom. First of all, course outlines (and addendums) and therefore SLOs are written and vetted by discipline faculty, not by an external agency or by administrators. Secondly, faculty do not have to abide by any single curriculum or pedagogy in order to help the students fulfill the SLOs. In fact, we totally agree with and embrace the principle Teeka James articulated, “While faculty are expected, and rightly so, to teach their courses as described in the official course outlines, academic freedom preserves faculty’s right to teach a course as they wish within the parameters of the course outline” (6). Bear in mind that SLOs are not an exhaustive list; they are the knowledge, skills, and/or attitudes that presumably all faculty teaching the course consider core to the course. Thus, while faculty abide by those SLOs and the related course objectives, each faculty member determines how to enable students to achieve those SLOs. The variety of instruction will ideally address the needs of the diverse learners in our midst. And so long as faculty address those core SLOs, they are welcome to go above and beyond them. We’d like to wrap up by thanking you again for re-initiating dialogue about the SLOAC, and for doing what you’re entrusted with doing: defending faculty interests. But we are not your adversaries. Faculty assessment committees at all three colleges have done everything possible to create SLOAC processes that empower faculty and are ultimately about improving student learning while still fulfilling the somewhat nebulous accreditation standards. United, we stand to have a much stronger voice both regionally and locally. Regionally, we need to stand strong against one SLOAC model being imposed on us with total disregard of our respective campus cultures, as well as assessment results being used punitively against campuses, let alone faculty. And locally, we are presented with a very timely opportunity to negotiate the best conditions for faculty to engage in the SLOAC in a meaningful yet manageable way when the Performance Evaluation Review Committee (formerly the Trust committee) convenes in the Fall. We are many faculty throughout SMCCCD who disagree wholeheartedly with the sentiments expressed in the article in the February Advocate newsletter entitled, “SLOs Creep into Syllabi and Faculty Evaluations in Violation of Contract and Academic Freedom” (James). The opinions stated in the article are not widely shared by the faculty that AFT represents. We feel the AFT 1493 has grossly misrepresented faculty and endangered our accreditation status with its unfounded statements. Misrepresentation #1: That SLOs have “crept in” to syllabi in a hidden, top-down manner. This is patently untrue. The SLO process at SMCCCD has been completely transparent and faculty-driven. All campuses are actively engaged in the SLO process as evidenced by myriad trainings, flex day sessions, printed materials and manuals, online support systems, meetings, Senate presentations, our last Accreditation process, and the required inclusion of SLOs in all course outlines. 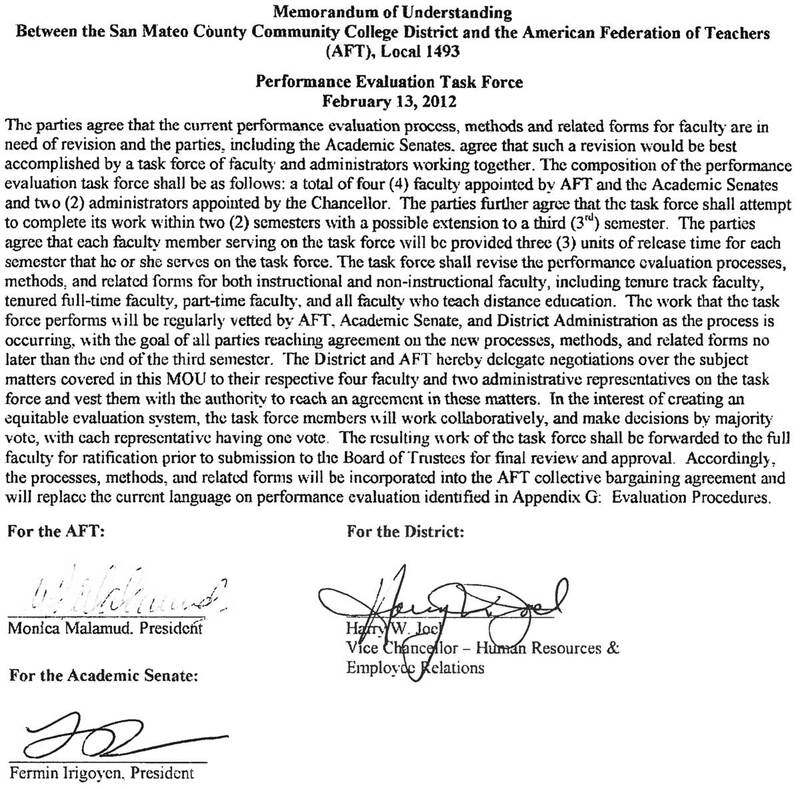 The AFT mischaracterizes SLOs as being a sudden directive pushed upon an unwilling faculty by administration. Misrepresentation #2: That including SLOs on syllabi compromises academic freedom for faculty. We faculty do not believe that putting an SLO on a syllabus violates any of the above tenets. SLOs are, in fact, an example of “open inquiry and rigorous attention to the pursuit of truth” in that they inform students of what departments have determined students will be able to do upon passing courses. The creation of syllabi that are consistent with course outlines is totally the responsibility and purview of faculty. Misrepresentation #3: That SLOs on syllabi directly result in SLOs being used as evaluation criteria. This is a falsehood. Our current evaluation process is a negotiated process that has nothing in it about SLOs; henceforth, we cannot be evaluated on SLOs. Later, the article says, “AFT’s position remains: faculty are free to include or not include SLOs on their syllabi.” To acknowledge the truth of the latter is to contradict the message of the former; acknowledging one’s freedom to include or not include is to support the choice to agree, or refuse, to include. It is difficult to see how the article could be taken in any way other than to dissuade faculty from participating in the SLO process, and this act of dissuading is reckless, irresponsible, and inappropriate. The publishing of this article by AFT leadership may imply that the faculty of the three campuses, led by the faculty union, are refusing to comply with the SLO process. In fact, several faculty groups throughout the district are now discussing their own dissatisfaction with the ideas contained in the article, evidencing broad disagreement and concern over misrepresentation of faculty opinion. We faculty look forward to complying with the Accreditation process and providing SLOs on our syllabi in the same faculty-governed, student-focused manner in which SLOs have been generated. We greatly appreciate the willingness of the faculty who wrote the two responses to present their views in The Advocate and to further the dialogue on the issues presented. We would like, however, to briefly clarify some points in the article by Teeka James (which presented the view of the AFT 1493 Executive Committee) that seem to have been misunderstood by some readers. The article does not in any way criticize SLOs, the SLO process, the faculty participating in that process, or the inclusion of SLOs on course syllabi. The article does not say that SLOs or the SLO process has been hidden or top-down nor does it suggest that listing SLOs on course syllabi infringes on academic freedom. In fact, many faculty members—including many members of the union’s Executive Committee—do include SLOs on syllabi, but to do so is a personal choice made by each instructor, one that in many cases may be guided by departmental policy; however, it cannot be mandated by administrators. The point of the article, and AFT’s position, is that administrators may not require faculty to include SLOs on course syllabi, nor may they evaluate faculty based on their participation in SLO development and assessment. These are working conditions, and if the District wants to propose changes to working conditions, it must negotiate these changes with the union, as is required by law. Nevertheless, some administrators have acted unilaterally on these issues, without informing or negotiating with AFT. It is these unilateral actions by administrators that the article says are top-down and an infringement on academic freedom. Again, we thank the faculty who wrote to the Advocate to share their views on this important issue. We want to remind all faculty that the monthly AFT meetings are open to everyone, and all faculty are encouraged to actively participate in them. Your voice is the union. Negotiators for AFT 1493 are going to Fact Finding on May 1 and May 2 in pursuit of a new contract for all faculty in the District. The four issues that will be addressed in Fact Finding are listed on the petition below. Before the Fact Finding process begins, AFT is organizing a contract campaign that will give faculty the opportunity to express their support to the AFT Negotiating Team. AFT activists will be visiting faculty in their offices over the next six weeks to talk about the issues and to ask for your support. Specifically, AFT would like to ask all faculty to sign the petition below when you are visited by an AFT representative in your office. I support our negotiating team & demand a fair contract now! We have given decades of dedicated service to our colleges, our students, and our communities. It is unconscionable that the Board of Trustees gave salary increases to administrators after more than two years of supposedly “good faith” negotiations in which the colleges consistently claimed there was no money available for faculty. While the dispute over our contract is headed to fact-finding, we aren’t waiting for an outside party to tell us what we already know—that we deserve better treatment from this administration. Binding arbitration ensures that, when a faculty grievance goes to arbitration, the decision made by the arbitrator is binding rather than advisory. Without binding arbitration faculty must trust that the Board of Trustees will always know what is best for you! AFT 1493 believes that it is better to trust the good judgment of a professional impartial arbitrator. Binding arbitration is standard contract language in the overwhelming majority of California community college districts that are represented by AFT. Our neighboring districts, Foothill-DeAnza, San Francisco, Marin, Peralta, Chabot-Las Positas, San Jose-Evergreen and Contra Costa, all have binding arbitration. For myriad reasons—among them the accreditation recommendations from ACCJC about evaluating Distance Education courses and linking SLOs to faculty evaluation (both of which AFT has recommended be dealt with by this committee)—it is critical that the “Performance Evaluation Task Force” get started on its work at the beginning of the fall 2012 semester. So AFT and the District Academic Senate are now finalizing the process for selecting the faculty this semester who will serve on the committee. Interested faculty should keep an eye open for the announcement, which will include information about the committee’s charge as well as the desirable qualifications for those who are selected to serve. All faculty, however, will be able to participate in guiding the revision of these important documents and procedures, for the committee will be in constant consultation with faculty through the Academic Senates and AFT during the revision process, which is expected to be completed within three semesters. Representatives of various faculty groups, such as part-time instructors, distance education instructors, librarians, counselors and coaches, will be asked to consult with the committee in order to represent their special situations. AFT wishes to thank the District for finding the resources necessary for this project to be completed successfully and efficiently, and AFT greatly appreciates the energy the District Academic Senate put into getting this agreement signed. We look forward to continuing to work collaboratively with the Senate on this and many future projects. The MOU appears below. In the midst of the budget crisis in the state of California, students from UC’s all the way to community college and high schools are fighting back. “Occupy Education”, the leading anti-budget cuts student organization in the state, made a call at the beginning of the year to organize across the country for mass action on the date of March 1st. In California, students, teachers, and unions worked together to endorse the March 5th march on the state capitol (March in March). Actions for the 1st of March were less centralized than past education protests here in the Bay Area, with the majority of actions taking place locally on campuses. Spirits of many who otherwise would have participated were dampened by the rain that day, especially here in the district at CSM and Skyline colleges. However, high school organizers in the Jefferson Union High School District did excellent work in organizing walkouts at Terra Nova and Westmoor High. Numbers of participants in the walkout at Westmoor were estimated at four hundred students, and Terra Nova’s Progressive Students Union led a march of sixty students through the local neighborhood to the Highway 1 entrance, with chants and signs supporting their teachers and fellow students. A rally was held at 4pm that day in the Civic Center of San Francisco, where some of these activists and more from the San Francisco area, including unionists, met to hear speakers on issues revolving around the fight against the cuts. March 5th was an eventful and spirited day, (without rain!) 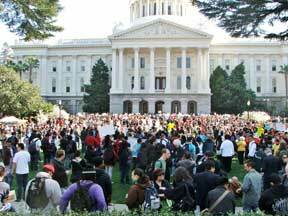 Student governments from all levels of higher education in California organized to march on the capitol under the annual event of the “March in March”. An estimated 5,000 students were in attendance, and the more militant activists came to spread the word about the occupation of the capitol rotunda, which took place at 1pm that day. An agreement to a battle plan among the activists was also reached, involving organizing for upcoming actions around International Workers Day (May Day) and other events. The occupation ended that evening with around seventy arrests and massive publicity on five television stations and many newspapers. The day energized those participating and cemented some new bonds between activists involved, especially those who walked on the 99 Mile March from the Bay Area to attend the occupation. Students and teachers understand the resistance against these cuts has only begun, focusing their efforts on a statewide student strike sometime this year, and throwing their weight behind the Millionaire’s Tax Initiative. It is time the 1 Percent pay their fair share! Josh Pechthalt, President of the California Federation of Teachers (CFT), sent a message (see below) in support of the Millionaires Tax to the March 1st Civic Center Rally in San Francisco organized by a broad coalition of labor, student and community organizations. An estimated 1200 to 1500 people attended the rally — mostly teachers and students from San Francisco K-12 schools, City College of San Francisco, and San Francisco State University. On March 15, leaders of the campaign for the Millionaires Tax and Gov. Jerry Brown announced that they had agreed on mutually supporting a compromise tax initiative. The new measure would increase the sales tax by a quarter of a cent instead of Brown’s proposed half-cent. Personal income tax would go up one percent for individuals making $250,000 a year or couples making $500,000 a year. Individuals making $300,000 a year or couples making $600,000 a year would see a two percent increase. And, taxes for individuals making $500,000 and couples making $1 million or more would increase three percent. The personal-income-tax increase would last seven years, and the sales-tax increase would expire after four years. As we go to press, CFT is continuing talks with Brown over the campaign for the new tax measure and signature gathering by the Millionaires Tax campaign continues as well. CFT leaders say they do not plan to stop signature gathering until they assess that the Governor has deposited sufficient money in the new initiative’s campaign account and confirmation by signature gathering firms that they can gather enough signatures on the compressed timeline required to qualify the measure. CFT is proud to be standing side by side with you here today, and proud to be working with a statewide alliance of community and union partners to promote the Millionaires Tax for the November 2012 ballot. The Millionaires Tax will raise taxes only on the wealthiest Californians, people who make more than a million dollars a year. The Millionaires Tax will permanently generate around $6 billion per year to begin to restore funding to schools and services. This modest tax increase on people who can well afford it is the most popular tax proposal and most likely to pass, according to extensive polling. Voters recognize that there is growing economic inequality, and that it’s time for the rich to pay their fair share for education and services. The Millionaires Tax builds on the efforts of the Occupy Movement and is energizing our members, community partners, students, and activists. The Millionaires Tax recognizes that working and middle class families have already paid their fair share. Across the state educators have lost jobs and suffered salary and benefit cuts. The communities in which we live and work have seen vital human services cut. When our political leaders talk of shared sacrifice, we have already done our share. It’s time for the people who have benefited the most to give back to the children and the people of California. CFT is working with a progressive coalition that is expanding daily. California Calls, the Courage Campaign, and the California Nurses Association, are only a few of our partners ready to build on popular sentiment for real change. Yesterday MoveOn.org endorsed the campaign. When California votes for the Millionaires Tax in November, we won’t stop there. Real change only comes by building the kind of political movement that does not have to rely on politicians. A powerful grass roots campaign around the Millionaires Tax will strengthen the labor movement and deepen our relations with the community. Together we can restore funding for our schools and communities and create a California that works not just for the one percent, but for all its people. In mid-April AFT Local 1493 will be holding elections to determine the leadership of the Local for the next two years. Have you ever considered running for President, Vice-President, Secretary, or Treasurer, or member of the Executive Committee, of your Union? In other words, have you ever considered taking an active role in the organization that represents the interests of all faculty in this District? Would you like to contribute to the process of making some positive changes in this District for faculty? During a two-year term as a member of the Executive Committee, a faculty member would have a good chance to develop or improve their leadership skills. Members of the Local 1493 leadership team have various ways in which to hone their leadership talents: there are CFT conferences that newly elected officers and representatives may attend, as well as different workshops sponsored by the Community College Council from time to time. These are both excellent places to meet union activists from other Locals around the state and the country, and to develop new skills at the same time. AFT Local 1493 is not just the President or any other single faculty member. It takes many people to make this Union work well as the representative of the interests of all of the faculty in this District. Please consider running for a Union position, and let’s all together make our Union stronger and our district a better place to work. The following are remarks by Rodger Scott, member of the Executive Board of AFT 2121 (CCSF) to the March 1st Rally in defense of public education and social services at the SF Civic Center. Public education, K-12 through UC, needs your help to get 504,760 signatures by April 15 to put the Oil Extraction Tax Initiative on the November ballot. Sign and circulate petitions or make a contribution if you believe in the cause. Emily Munson is new Cañada College Executive Committee Co-Rep.
Emily Munson, Cañada College adjunct English instructor, was appointed, along with Lucia Olson, to be the new Cañada College Executive Committee Co-Rep. at the December AFT Executive Committee meeting. 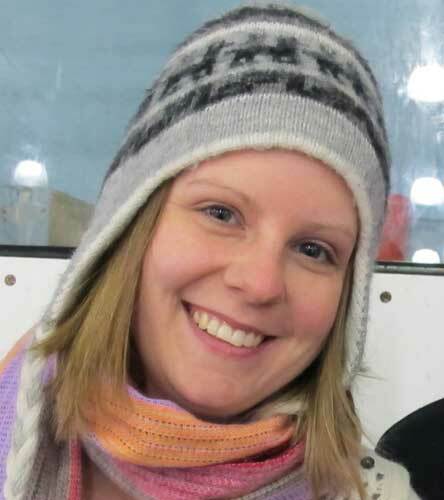 After graduating from college in 2002, Emily moved to Honduras and Mexico for three years where she taught English to engineering students studying in local universities. Thus began her passion for teaching college students. When she returned from her sojourns abroad in 2005, she was hired by the SMCCD district to work as an instructional aide for TRiO Student Support Services at Cañada College. Her work as a tutor sparked her interest in social justice and compelled her to return to school to work with students on a larger scale in the classroom environment. After completing three years of graduate school at San Francisco State University, she happily accepted a position teaching English part-time at Cañada College and has enjoyed teaching students in basic skills and transfer level classes for the past few years. After attempting to live off her hourly wage as an adjunct instructor, Emily became keenly aware of the inequality part-time faculty experience in the district and is now dedicated to working towards parity for all faculty. When she attended an AFT meeting with colleagues, they encouraged her to voice her opinion about important issues relevant to faculty members in the district. As a member of the Executive Committee, Emily is excited by the opportunity to represent the faculty at Cañada College and encourages her colleagues to communicate with her about the work-related issues that concern them. AFT 1493 will soon send out a Workload Survey to all faculty. This survey will help us to determine the total workload for full-time and part-time faculty, and how various activities contribute to the workload of full-time and part-time faculty. For example, the survey will ask about the amount of time that is spent on responsibilities that are required of all faculty and it will also ask about the additional professional responsibilities that are required only of full-time faculty. AFT is interested in gathering this feedback to help us in determining what the part-time/full-time parity goal for our district should be. The information obtained in the survey will be useful in future negotiations with the District, as we work towards achieving our parity goal. The Workload Survey will help AFT learn more about how the workload and the workforce have changed over the years. In particular, we want to quantify the heavier workload that all faculty have been experiencing, with more and more time now being devoted to various kinds of non-teaching responsibilities. We also want to explore the ever-increasing over-reliance on part-time faculty, and the shrinking numbers of full-time faculty now employed in the District. The Workload Survey should be sent out to all faculty within the next several weeks. Faculty may have heard that the San Mateo County Community College District is almost certain to become a “basic aid”* district this academic year. 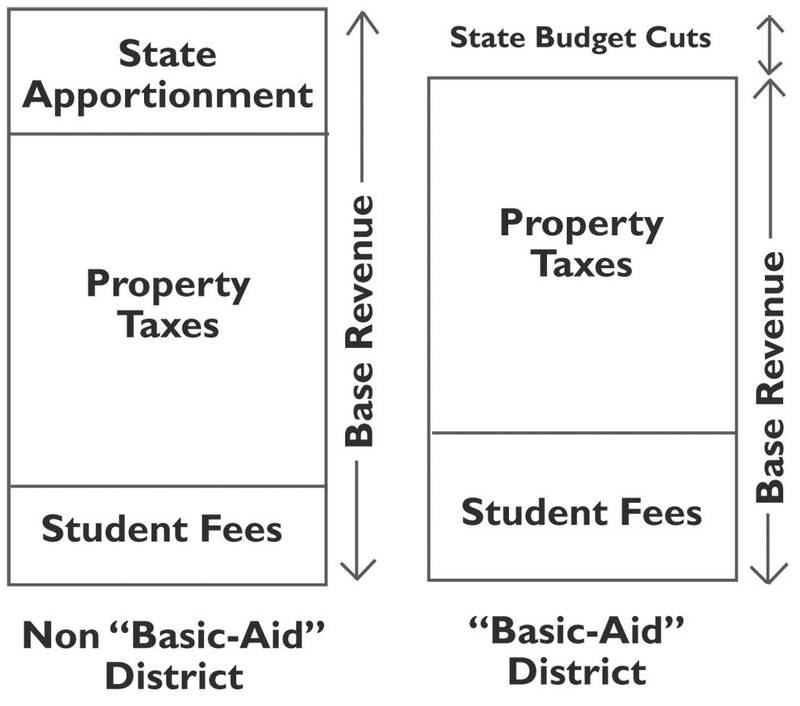 A community college district becomes “basic aid” when the local property taxes and student fees that the district receives is greater than base revenue that is determined by the state. In the past, our district, like all but three community college districts in California, received state apportionment money to make up the difference between the local property taxes and student fees and the base revenue (see chart). But the state budget woes have meant that the base revenue has been cut again and again, which means that the base revenue has dropped below the district’s property tax and student fee revenue. Being a “basic aid” district does NOT mean that the district automatically gets more money. It does mean that any future cuts in the state funding for community colleges will not have a direct impact on the district, meaning less likelihood of future budget cut battles. 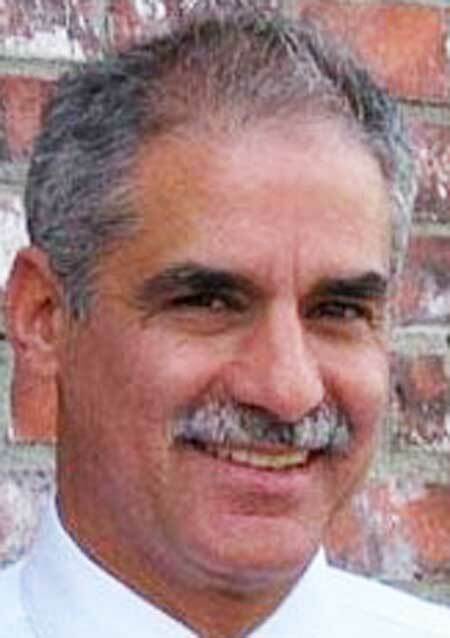 This is not a 100% guarantee, as it is possible that the state may try to put some of the burden of future funding cuts on “basic aid” community college districts, for example, by cutting categorical funding for student services such as Disabled Students Programs and Services, EOPS, matriculation and transfer, etc. While this protection from future state budget cuts is basically a good thing, there are other potential challenges that come with independence from state money. In the past, the district’s base revenue was based on student enrollment, so a drop in enrollment would lead to a cut in state funding. But if the district is not getting state apportionment money, the district could cut student enrollment. While this would mean less student fees, the cost savings from fewer classes would be even greater. Administrators have said that they have no plans to cut enrollment, but as faculty we will need to be vigilant to this possibility. For example, having fewer students who face more academic challenges could increase the district’s student success percentages, but would be a disservice to the very students that community colleges are for. Another potential challenge is the issue of the Faculty Obligation Number or FON. The FON is a state requirement for a minimum number or percentage of full-time, tenure track faculty. The penalty for districts that don’t meet their FON numbers is a cut in apportionment money from the state, which couldn’t be done if the district is not receiving state money. Thus there is the possibility that the district could lower the full-time faculty below the FON, for example by not replacing retiring full-time faculty. While administrators have said that there are no plans to reduce full-time, tenure track faculty numbers, the administration has resisted applying the FON to new district money from the parcel tax. Last but not least, the fact that future state budget cuts won’t affect the district doesn’t automatically mean that there will be more money for faculty. We have seen the district claim that they “don’t have the money” to raise salaries to even keep up with inflation or to reduce our rising health insurance costs, but they do have money to increase administrators’ and supervisors’ pay. As faculty we will have to work together, and join with staff and facility worker unions, to fight to protect our standard of living. * The term “basic aid” actually applies to K-12 school districts in California. Community College districts in this category are officially called “self-supporting.” There are three other self-supporting community college districts in California, Marin, South Orange, and Mira Costa.